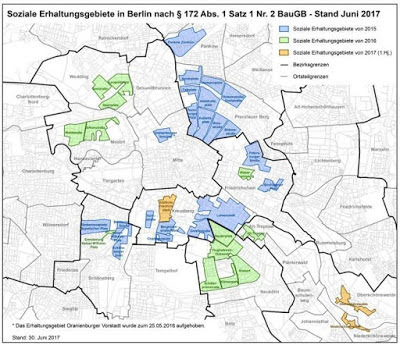 The Berlin-Mitte district council put the pressure up for “Milieuschutz”. In their last meeting before the summer break, the representatives demanded the district administration by resolution to identify the so-called observation areas Körner- and Lützowstraße in Tiergarten and Moabit the Lübecker Straße and the Thomasiusstraße and the Beussel district as “Milieuschutz” protection areas. Further to formally announce the dedication of the areas in order to apply the social conservation mechanisms as soon as possible. This means that homeowners must meet certain approval criteria for construction projects and take into account the rent index in the district. The “Milieuschutz” is an urban and social instrument for avoiding displacement of the existing resident population also known as gentrification.